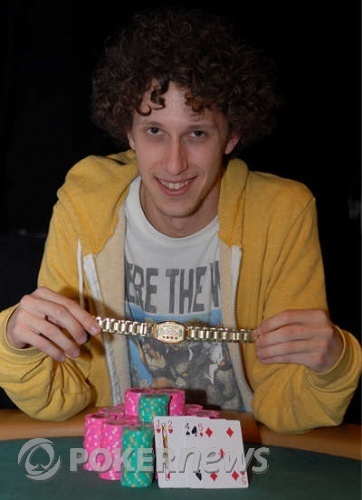 In a mammoth showing, young gun Andrew Brown has won the bracelet and the title here in Event #16. Brown is just 25 years old, and now has his largest tournament cash by a long shot. Before the final table, he said he was, "The best PLO player nobody knows." Well, this wasn't PLO, but he is no longer an unknown either. Brown played a pretty steady game for the first two days, but really turned it on today when it mattered. When he finally got heads up with Ted Forrest, he showed that he is more than capable of hanging with the top pros. For the first 30 minutes, Brown put on a clinic, and ran Forrest all the way down to 150,000. That was the easy part. Forrest battled all the way back to regain the chip lead with 1.235 million a short time after. Showing the poise of a pro in his own right though, Brown continued pushing hard, and finally was able to wear Forrest all the way down to the felt. Truly a remarkable performance from our new bracelet winner. 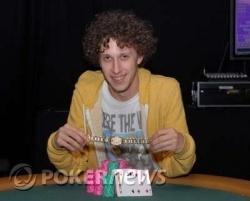 Congratulations to Andrew Brown, Event #16 Champion! With a raise and a call before the flop, the two men saw the flop come down . Forrest bet, and Brown called. The turn was the . Forrest again bet, and Brown snap-called. Andrew Brown takes down the whole pot, and the whole tournament, eliminating Ted Forrest in second place. Forrest walked away disappointed, and it unlikely the $143,420 will be much consolation to the pro. From the small blind, Brown comes in raising, and Forrest makes the call. The flop brings . Forrest bets out, and Brown calls. The turn is the . Forrest slows down, passing it over to Brown. He bets, and Forrest calls. Ted Forrest gets three-quartered out of this pot, and he has been knocked all the way back down to 450,000. About a half-hour ago, Ted Forrest seemingly couldn't win a pot. Andrew Brown was all over him, and without even looking at the chip stacks, you could read it in their body language. Brown was sitting forward in his chair and betting with aggressive motions. Forrest, on the other hand, was looking quite frustrated. After every pot, he would let out a disgusted sigh, stand up from his chair and pace around within a few steps from his seat. He had that "I-can't-win-a-pot" look about him, though it didn't seem to affect his play. Now, things have changed. As Forrest has clawed his way back into contention, his mood has lightened, and his demeanor has improved noticeably. He now smiles occasionally and chats loosely with the railbirds. He even stood up twice to hug a lady that is railing him particularly close-by. Andrew Brown raises from the small blind, and Forrest joins him with the call. The flop comes . Forrest checks, Brown bets, Forrest raises, Brown reraises, and Forrest calls. Fourth street brings the . Forrest check-calls a single bet this time. The river is the and both players check and turn over their hands. Forrest's is good enough to award him the big pot, and almost doubles him up to 970,000. Forrest also took down the following pot, and has snatched the lead back from Brown, although it is very, very close. 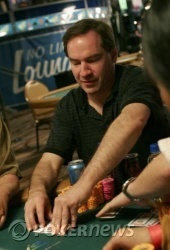 Ted Forrest has won the last two pots, and is back up to 600,000 even. It feels like we are poised for a big double-or-nothing pot at any time now. The board ran out , and Forrest doubled up with his ace-king high. Andrew Brown has been running over Ted Forrest heads up. In the latest pot, Brown limps in, Forrest raises, and Brown calls. The flop comes down . Forrest bets, and Brown calls. The turn is the . Forrest bets, Brown calls. The river comes the . This time Forrest checks, as Brown plunks in a bet of 100,000. Forrest regretfully makes the call, as Brown says, "Flush," and turns over . Forrest stands up with his cards, looking them over close to his chest. After checking them several times, he tossed them into the muck, looking frustrated. After that hit, Forrest is down to his last 150,000 in chips.